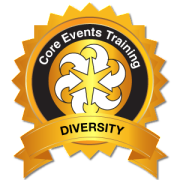 Core Events Accreditation for Diversity offers a complete training and development package focused on diversity and culture in the work environment. It is proven that cultural diversity training is the most important component of an overall business strategy. Core Events training on Diversity provides the knowledge, skills and tools to assist individuals/organizations to recognize the importance of inclusiveness. Specialized training for the “Core Events of Cultural Competency.” This is based on the fiction and non fiction tales of Work, Travel, Diversity and a Proud Heritage, written by Carlos Merla. The impact from “cultural profiling” – How perceptions are made based on how people look, and, how people look at you. Critical aspects of cultural competency – Building your knowledge of cultural awareness, knowledge and skill. Creating a “work culture” – Key elements of developing a diverse work culture. “Core Events of Cultural Awareness” – An overview of the book which is both fiction and nonfiction stories of Cultural Competency and a Proud Latino Heritage. Participant round-table open discussion to expose the opportunities or challenges of diversity and culture. Definition of the aspects of diversity and culture identity. What it means, globally and locally, at home and at the workplace. Assessment through the “Ten Lenses” Your guide to living and Working in a Multicultural World by Mark Williams.